- Thermostat based exact temperature control for perfect results with enough heating power for most fried food requirements. - Stainless steel dishwasher safe removable parts (except for the electric parts, like the heating element or the control panel) that are easily cleaned and maintained. ​- Baskets with sufficient capacity to generate enough fried foods for the whole family. - Last but not least, a high quality product with long durability. Nowadays, you will find a huge number of products that satisfy most of the above listed requirements, and it may be hard to decide which to get. To simplify the task, we will compare below the two deep fryers that were both the most popular among Amazon customers and had received excellent ratings from most users at the time this article was written. 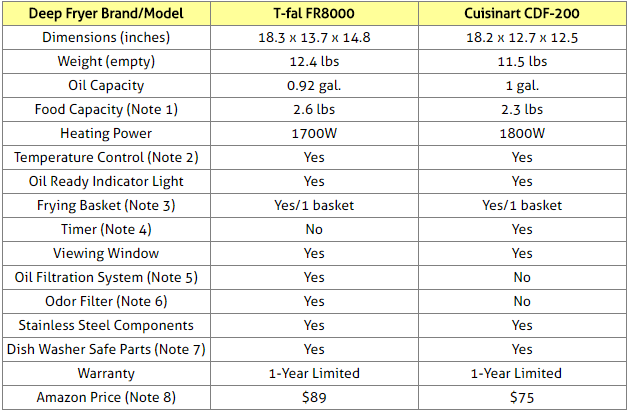 This article will compare T-fal FR8000 and Cuisinart CDF-200 deep fryers. These were not just the most popular among Amazon customers at the time this article was written, but they had also received excellent reviews from most Amazon buyers (an average of at least 4.5 stars each out of 5 stars!). 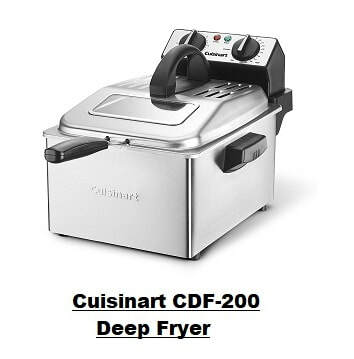 Selected Deep Fryers on Amazon. Both deep fryers have a nice family size capacity. The optimal relationship they display between oil capacity and food capacity keeps oil absorption to a minimum for healthier fried foods. Both fryers come with an adjustable thermostat that allows for deep frying at the right temperature by selecting the perfect cooking temperature for the specific food to be fried. The T-fal FR8000 has an easy to use 2-position basket for cooking and draining food. Cuisinart CDF-200 is equipped with a 30-minute digital timer . 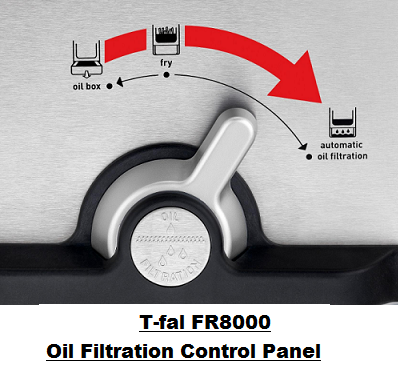 T-fal FR8000 has a patented EZ Clean oil-filtration system for convenient deep frying, cost savings, and simple oil storage. When finished, the innovative machine’s exclusive oil-filtration system drains and filters the remaining oil, once it’s cooled down, into a large plastic container below. The removable, tightly sealed container conveniently stores the filtered oil for future use, saving time and money. The cleaned oil can be used up to 15 times. Cuisinart CDF-200 does not automatically filter the oil after use. If you want to use the oil again, you should filter it yourself manually after it cools down and store it. 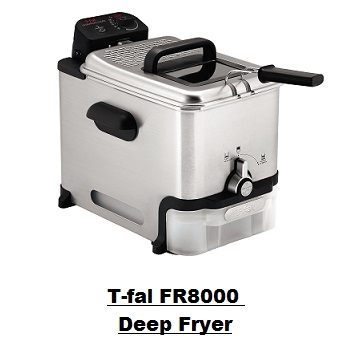 T-fal 8000 fryer has a permanent odor filter to keep cooking odors out of the kitchen. 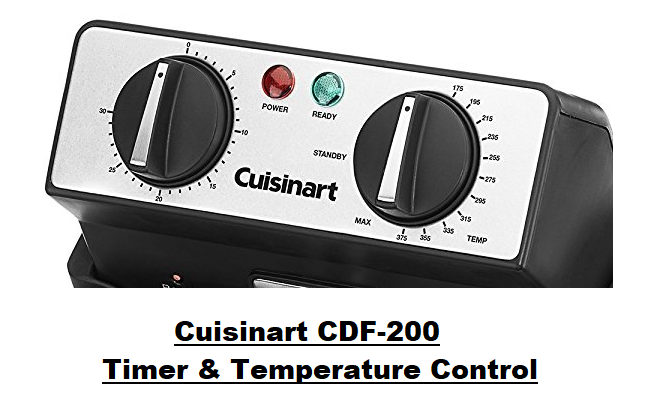 Though Cuisinart CDF-200 does not have an explicit odor filter, users have reported that there is very little odor, if any at all. Both deep fryers come with dishwasher safe removable parts (except for the control panel and the electrical heating element). So which of the two deep fryers to buy? ​The two deep fryers considered here are excellent products as shown by the average rating each had received from Amazon customers at the time this article was written. Indeed, both T-fal FR8000 and Cuisinart CDF-200 had received 4.5 stars (out of 5 stars) ! Note that they are quite similar in many respects: they have comparable oil and food capacities, comparable heating power, thermostat based exact temperature control, and they both have stainless steel parts that are dishwasher safe (except of course for the heating element and and electrical control panels). So, there is a good chance that you would be quite happy with either of the two deep fryers. T-fal FR8000 is equipped with an automatic oil filtering system which allows you to filter the oil after use and keep it for the next time. Unless you don't mind filtering the oil manually yourself after each use, you might want to consider the T-fal 8000 deep fryer. 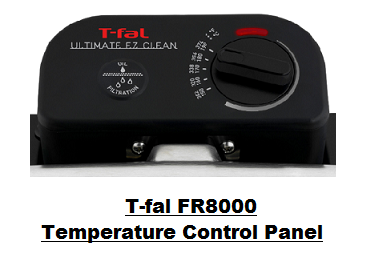 ​T-fal FR8000 is also equipped with an odor filter. But, that should not be a real problem for those opting for Cuisinart CDF-200, as many Amazon customers that have used it have reported very little or no odor at all. Cuisinart CDF-200 is equipped with a 60 minute digital timer. If you like to follow recipes with exact cooking times, then you should definitely consider this fryer as T-fal FR8000 does not have a timer. Before deciding which to get, you should keep in mind the above points, so you may choose the deep fryer that will respond best to your needs. Please click the deep fryer of your choice below for price information or to purchase.